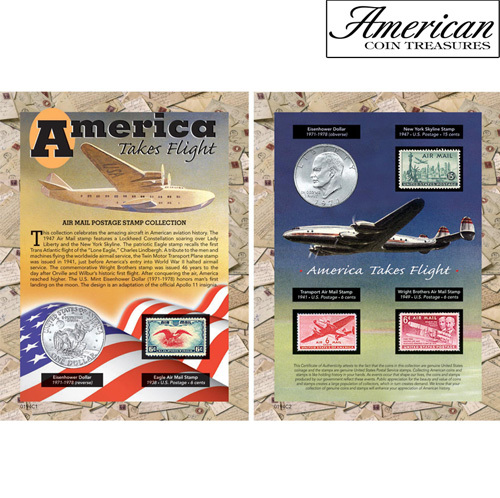 Celebrate America's amazing aviation history with this collection. The six-cent Eagle Air Mail, first introduced in 1938, is featured on the front of the display Beside it is the reverse of the Eisenhower Dollar honoring man's landing on the moon. On back you see the coin's obverse with Twin Motor Transport Plane stamp (first issued in 1941)...Air Mail (first issued 1947) featuring Lockheed Constellation over New York...Wright Brothers commemorative (first issued 1949). Certificate of authenticity is included.